I’m Kanuk. Marianne thinks that’s a boy’s name and I’m a girl so she calls me Kanu. What do you think? I’m living at Marianne’s now. It’s been a long trip to get here and I’ve been with several people but I hope to find some people I can adopt where I can stay forever. 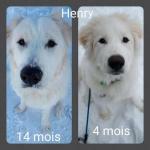 I really would like to find my very own human to love and take care of! Marianne says that I have to go to a home where I’ll be alone to take care of the humans She says I’m too protective to share the work with another dog. It’s I just don’t want to share their attention! When I was really small I went to live with a family that let me live in the house for a while. 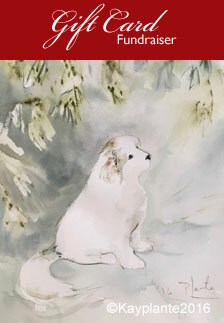 I had to be quiet and I tried not to bark but I’m a Great Pyrenees, after all. I did bark when I was alone a lot. They had me debarked because the neighbours complained. Something must have happened because they would spend weekends drinking from bottles and I was put out of the house. I’m not sure how old I was but someone else took me because they felt sorry for me. Unfortunately there was a Husky already living there and I wanted to show these people that I could take care of them myself. I didn’t get on with the Husky and we got into some arguments last summer. They thought my coat was too hot so they shaved me. I tried to tell them that I was fine and that i just needed to be brushed out but they wouldn’t listen! These people talked to some of Marianne’s friends asking them to take me. They waited for another couple of months but then in November they called these friends and said that either I should go the Nadia’s or they would take me to Berger Blanc. 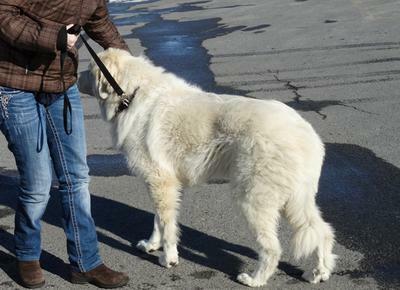 Marianne says that this is not place for a great Pyrenees. 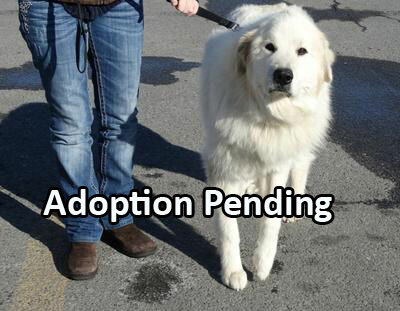 She says it’s not a place for any dog but especially not for a Pyr. In that case I’m glad that Nadia took me in. Because Bianca already lived with Nadia, she brought me to Marianne. I stayed there for two weeks. She took me to the vet and I got vaccinated and checked over every which way. The people at the clinic were really nice. 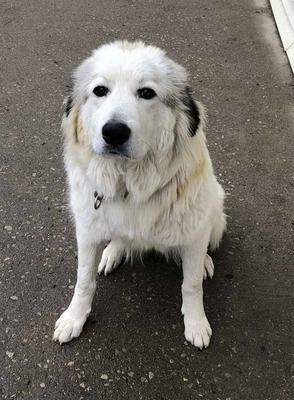 I lived in the kennel in my own room and my own yard but Marianne would let me go out and check out the boundaries with Ushan, the big Pyr boy who takes care of her and the other Pyr girls who live with her. Nadia and I had kind of liked each other. 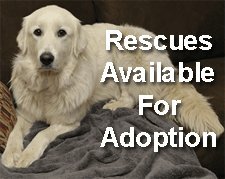 She called Marianne about me to take me in as a foster until I could find a good home. 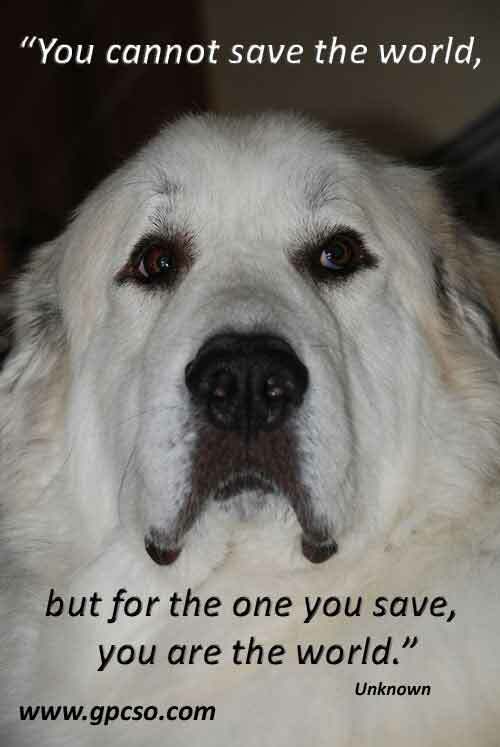 Bianca, her senior lady old Pyr, welcomed me and tried to show me about but she sleeps a lot so I thought I could start to help her out. Bianca would try to show me what to do but I had my own ideas about how to do the job. One day I was having a snooze and Bianca woke me up suddenly. I grabbed her snout without realizing it was her. After that, she avoided me and I lived downstairs while she lived upstairs. So, I came back to Marianne. You know, it’s a bit like coming home. I knew where to go and what to do here. The other dogs barked to tell me they recognized me. I don’t know what to do here because we are several to do just the work of warning off the hawks, the helicopters, the satellites, the UFOs, the raccoons, the foxes and keeping the barn cats in line, guarding Marianne from all those pesky missionaries and talking among ourselves. Marianne is right that I should have people of my own to take care of and that I can do it all alone. I have now been in four different places and I’m okay here but I’d really like my own place. Would you like me to take care of you? What a lovely sweet girl this is. Nanu is a house dog about 4 years old. Nanu is a loving girl who only needs a bit of guidance since she has lived in four different places, 3 of those in the last year. Although understandably a bit tentative right now, as soon as she feels more confident of her place she will show her true loving, cuddly playful nature. Presently, she ignores the other dogs. She only runs with my male. So she has been de-barked. She has been shaved, but the coat is coming back slowly with the help of some fish oil and apple cider vinegar. She has been told to stay away from the food dish. I suspect there was some food aggression with the husky because she always goes far away when I put the food dish down and only approaches it when I leave. 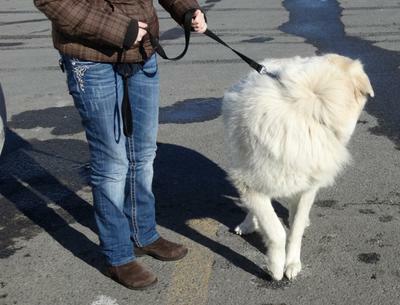 She walks quietly on leash doing the usual Pyr check every so often to be sure I’m there. 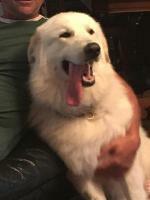 She knows 'sit’, ‘down’ and ‘come’, although ‘come’ happens in the usual Pyr time. When it’s time for a walk, there are usually several stops and starts for the come. She recognizes the leash and wants to come but approaches and retreats several times as if she’s not sure it’s for her. What a wonderful companion she will make for some lucky soul who will have the patience to work out the tentativeness! Do you still have a dog with you ? I saw 819. Do you live in QC ? Quite possibly. If the introductions are done right, Kanu learns fast! Would Kanu like to come to Calgary? Do you think Kanu would like to come to Calgary? 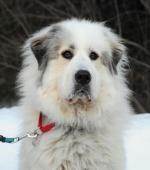 Would Kanu be ok in a house with no other dogs, and only adults - with a big yard, close to a park? How about a dog walker in the day, and a dog sitter who watches dogs when I am away - do you think in those situation Kanu would be able to get along with the other dogs on the walks or at the dog sitters?